Actually, they should now be in their winter quarters in Spain and France. But winter does not seem so grim that it would be worth the long journey. The Rambower Moor offers good conditions not only as a breeding ground, but also for rest and perhaps also for wintering. In the shallow waters, they are protected from predators, and the table is richly set for the grey birds. Dozens of them stand in shallow water. In the overwintering phase, the birds meet in strong groups, which then join together at night with other associating groups. Again and again some Cranes show their wings spread wide, as if they already wanted to start with the courtship dances. Otherwise, they are searching for food. Nor can the cranes be greatly disturbed when a strong young White-tailed Eagle (Haliaeetus albicilla) orbits in the blue sky. A little later, Whooper Swans (Cygnus cygnus) fly in with their insistent, trumpet-like cries. 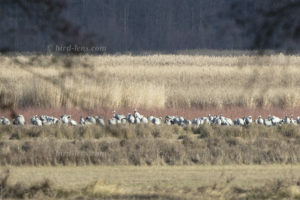 Again, the Cranes feel not disturbed. Just as little as with the repeatedly shouting Taiga Bean-Geese (Anser fabalis), which gradually come in larger numbers to the largest lake in the moor. The elegant birds have always fascinated people, not only because of their beauty and their amazing formation flights, their calls ring in the fall of winter and announce its early end in early spring. The loud bird swarms direct the gaze into the sky – a respite for the perception of nature. From February to April, the Common Cranes arrive from their wintering groundsin Spain and France to return to their breeding sites in central and northern Europe. The Common Crane is one of the largest native birds of Germany. Its wingspan is otherwise only reached by White-tailed Eagles or Swans in our latitudes. The characteristic trumpeting calls of the birds often herald the coming of the swarms before they are seen. The stock of majestic birds has recovered well in recent decades through conservation and restoration measures. 85 percent of the German population breed in Mecklenburg-Vorpommern and Brandenburg. 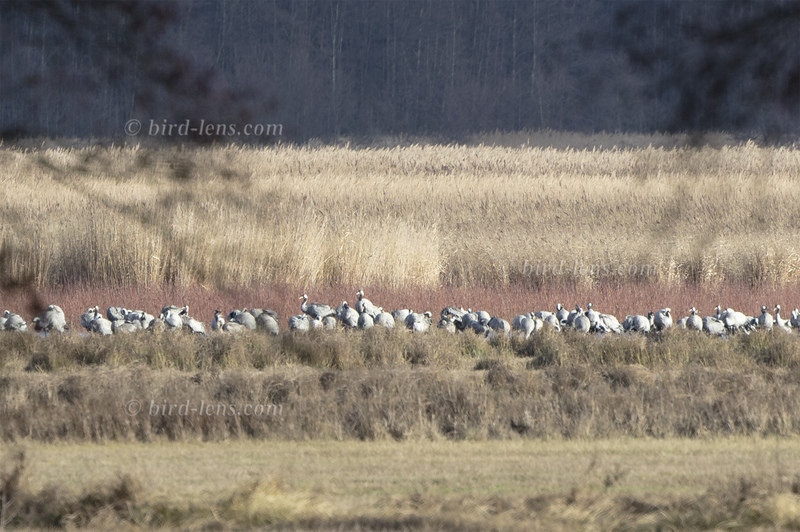 For several years, more and more cranes have been observed, which also spend the winter in Germany. The Rambower Moor is a scenic feature in the Prignitz. Ice age washed out the so-called Gorleben-Rambower salt structure with underground cavities. A geological formation that stretches from the Prignitz to the neighboring Wendland, where its salt flats should serve as repositories for nuclear waste. On the northern side of the Elbe this geological formation has formed a ten-kilometer burglary sink between Rambow and Lenzen, which is up to a kilometer wide. The margins are wooded, the lower parts are largely moored, dotted with some lakes. The formerly drained soils were extensively rewetted and renatured in the early 2000s. A very special habitat, where rare animal and plant species have resettled. To cope with the growing demand for top shots of the rarer species of the Palearctic Bird-Lens is keen to enrich the range of pictures of birds you can find in the western palearctic. Trips to different places like this one to capture images of rare birds of western palearctic were very successful. The nice images you find in the gallery are only a first impression, what you will find in the gallery in the “Picture Shop” very soon. Just give me a message, if bird-lens.com could serve you with an image needed before the new pictures are online. Other successful shootings you can see under: www.bird-lens.com in the pictures shop.